The answer was obvious, really. Was it the low point of his career? 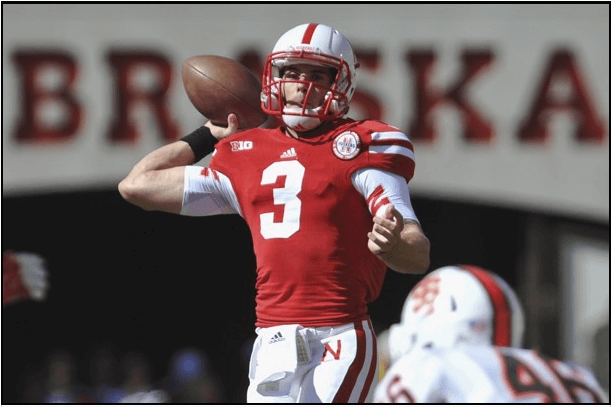 “Yeah, I think so,” Nebraska quarterback Taylor Martinez said on Monday. “It” was a reference to last season’s 48-17 loss at Wisconsin, the Huskers’ first conference game as a member of the Big Ten. Martinez threw three interceptions during a 5-minute-plus stretch that included the first play from scrimmage in the second half. Nebraska led 14-13 when the stretch began, and trailed 34-14 as a result of it. So yes, Martinez probably hasn’t endured any more adversity than that. But a year has passed, no pun intended, and Martinez has learned a good deal since then. The numbers reflect it. In four games, he has completed 65-of-92 passes for 878 yards and nine touchdowns, with only one interception. His completion percentage is 70.7, his efficiency rating 180.93. Numbers can be numbing, of course, but in this case, they can be instructive as well. “People snickered when I said Taylor is going to make a big jump this year, and he has,” coach Bo Pelini said. “I saw it through the spring. I saw it in practice through fall camp. More numbers reflect that. Nebraska ranks first in the Big Ten in total offense, rushing offense, pass efficiency and scoring. Even though what the Huskers did in a 73-7 victory against Idaho State distort those averages, they’ve shown the elements of a potent offense. That offense is among the reasons for optimism as Nebraska enters Big Ten play against Wisconsin on Saturday night at Memorial Stadium. Less than three weeks have passed since a 36-30 loss at UCLA, and yet much as changed in the perception of where the Huskers fit in the conference race. The Wisconsin game will set the tone and initiate a rugged five-game stretch that likely will determine whether Nebraska makes a trip to Indianapolis for the Big Ten Championship on Dec. 1. After Wisconsin, the Huskers play back-to-back road games against Ohio State and Northwestern, play Michigan at home and then travel to Michigan State. How they fare during that stretch will depend on more than the play of Martinez, of course. But the junior from Corona, Calif., is a lightning rod for the team’s fortunes. Pelini was asked if he expected Martinez to continue the passing efficiency of the first four games. “I fully expect him to go up this week,” Pelini said. “We’ve had to pull back the reins on him a few games. I think he’s going to continue to play well because that’s what I’ve been seeing from him. I have a lot of confidence in him, and I think he’s an outstanding quarterback. Martinez appeared to be relaxed at Monday’s weekly news conference, talking about his younger brother Drake Martinez, a running back-safety at Laguna Beach (Calif.) High School to whom Nebraska has offered a scholarship. Taylor expects his brother to be at Saturday night’s game. “It’s exciting to have him come,” said Taylor. Martinez threw only three interceptions after the Wisconsin game last season to finish with eight, compared to 13 touchdowns, for an efficiency rating of 126.5. We might have seen the worst against Wisconsin last season – in Martinez’s estimation, anyway. That was the low point of his Husker career. His answer to the question was anticipated.